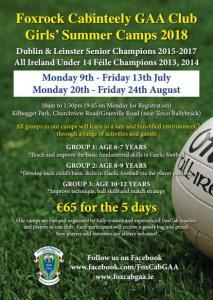 Foxrock Cabinteely GAA Club is running two camps this summer. We will have a “sign up” night 7:15pm - 8:30pm this Tuesday June 12th in Kilbogget clubhouse. We have a team of experienced coaches in place now and we are looking forward to welcoming the girls. Each camp will be grouped by age so we can fully challenge the older girls, as well as teach the basic skills to the younger ones. We will have a range of fun games and well organised drills followed by small sided matches so the girls get plenty of ball-time. Fridays we will have a mini World Cup all day with prizes. Don’t miss your chance to secure a place before the summer rush!